designtocaredaily: Are You Stressed Out? Discover These Powerful Essential Oils For Stress Relief. Are You Stressed Out? Discover These Powerful Essential Oils For Stress Relief. In today’s worlds, stress is almost impossible to avoid. But essential oils can bring some relief from stress so that you can calm your mind and body and reduce the risks associated with it. The most commonly used oil for stress relief and relaxation is lavender. Lavender is also helpful for improving concentration and for helping out to get a better night’s sleep. It can also be used to reduce headaches caused by stress. Grapefruit essential oil can also be used to improve your mood and reduce fatigue caused by stress. The aroma of this oil is refreshing and can help reinvigorate you during those tired afternoon hours. Eucalyptus is also known for its refreshing properties. It has a minty aroma and can cause the skin to feel cool when it is applied. Eucalyptus can be used to help open sinuses when you have a cold or congestion. But it can also help pep you up during stressful times and alleviate fatigue. Orange is another citrus fruit that has an uplifting quality. It can relieve stress and even improve mood when used regularly. Orange oil will help to give you a boost when you’re dragging. Rose essential oil works to relieve stress by promoting a feeling of peace and calm. It is frequently used for stress relief as well as depression. Many people report feeling more positive with use. Stress can often make it hard to focus. Sandalwood essential oil can help to improve your focus and clarity. It has a woodsy aroma that is calming and warm. Adding it to a diffuser can bring on a feeling of emotional wellbeing. Cedarwood is similar to sandalwood in that it has a woodsy aroma. It has actually been shown to stimulate the release of serotonin – the happy hormone. Using it regularly can help you to have a better mood and also to sleep more soundly. Ylang ylang essential oil comes from the ylang-ylang flower. This essential oil can help you to feel calmer but it can also help you to feel more alert. It is particularly helpful for helping to calm feelings of anger. Jasmine essential oil is a natural substance that can calm anxiety. If you’re prone to feeling overwhelmed and anxious, this is a good oil for you. It will help you to have better sleep, feel calm, and even improve your libido. 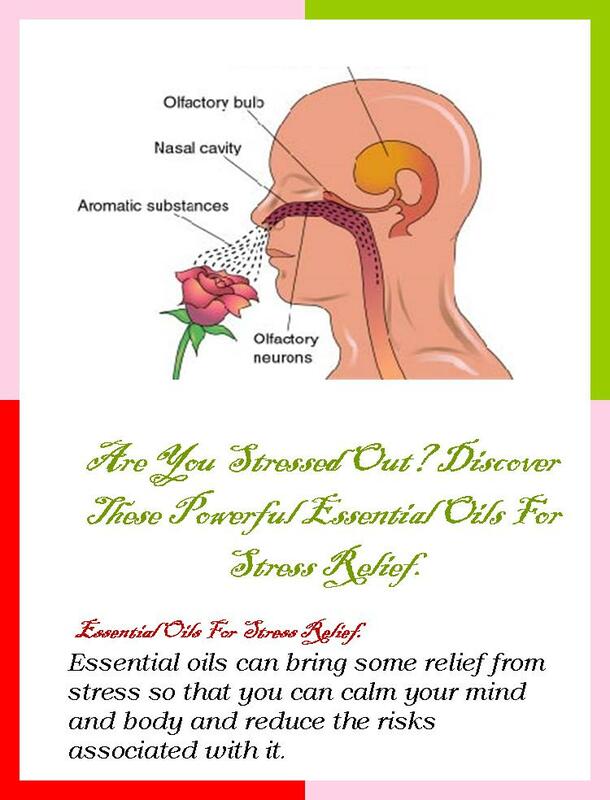 Frankincense oil is also useful for alleviating stress. This essential oil has been used for many years both medicinally and in religious services. It is deeply connected with spirituality and is thought to bring better feelings of peace and intuition. All of these oils can help with reducing and managing stress. You can use them in a room or person diffuser to help inhale the fragrance and medicinal properties. Some people also create massage oils using a carrier oil such as coconut oil with a few drops of the essential oil. You can also add a drop or two to your wrists or temples which will allow you to inhale them for several hours. Note: This post should not be categorized as a medical advice but as an observation.